Imagine living in a town, surrounded by some of the best beaches in the country and growing with the ever-expanding economy that encompasses it. Just think about all of the opportunities for growth and improvement, not only in business, but in quality of living as well. You won’t have to look far to see why more and more people are calling Marco Island home. Here is our guide to Marco Island living. You may just want to start thinking about making the jump to the Island. Marco Island is located just 40 miles south of Fort Myers and a few minutes’ drive from the famous luxury shops, fine dining and tourist spots in Naples. With a relaxed atmosphere and scenic views, Marco Island is the place to be when it comes to enjoying life. Steps away from exquisite white sand beaches and waterfront dining, Marco Island is proving that it’s not just a place for visitors anymore. In recent years, more and more residents have been putting down roots in this beautiful beach town. The largest of Florida’s Ten Thousand Islands, Marco Island features a crescent-shaped beach that stretches the entire length of the island’s west side. Tigertail Beach is located on the island’s northern end and is a spectacular place for observing the local wildlife, hosting gatherings or simply lounging on the beach. 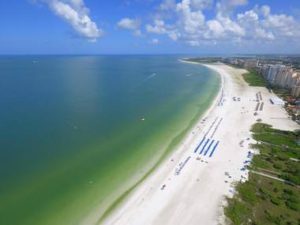 Other beaches found on Marco Island include Resident’s Beach, South Beach and Marco Beach. World-famous fishing, an abundance of nature and crystal waters make Marco Island truly a sight to behold. In addition to the natural scenery that Marco Island has to offer, residents and guests can also enjoy fine arts, such as The Art League of Marco Island, which brings paintings and sculptures to the island from artists across the United States. The League also offers classes, workshops and gallery shows. Marco Island is close to over 80 fine dining restaurants, highlighting Southwest Florida’s spectacular seafood, straight from the docks, world-class golf courses and luxury boutiques. As many more companies have started calling this area home, Marco Island has seen an increase in job growth and now ranks among the highest in the entire state. Job rates have increased in recent years, and the unemployment rate is lower than the national average. More families have started to populate the island, having decided that this is the place for them, making Marco Island home to top-rated schools, such as Tommie Barfield Elementary and Marco Island Charter School. You may have never dreamed of living someplace so peaceful and serene, but Marco Island has it all. Beaches, restaurants, hotels, a booming business district and stunning homes make this area a popular choice for visitors and families alike. Marco Island is a place for everyone, offering families the chance to grow and visitors a taste of what Southwest Florida has to offer. Take in some of the best sunsets in the country and enjoy yourself on Marco Island. The experts at Frey & Son are ready to build you the perfect home on Marco Island. Call (239) 495-8200 or visit www.freyandson.com to learn more!